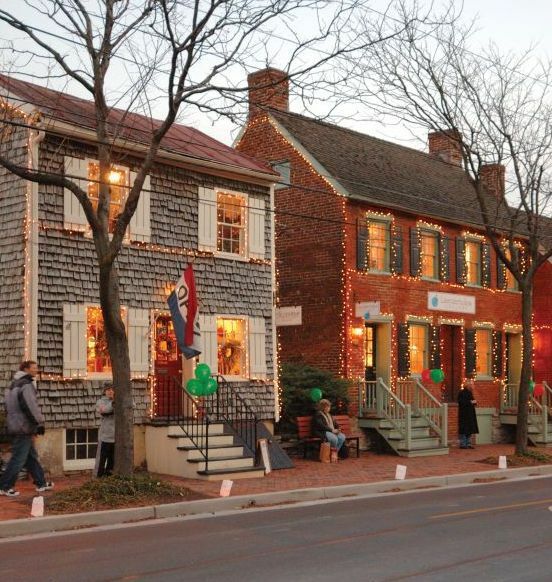 The Christmas season is a great time to explore Frederick, Maryland and enjoy a variety of seasonal activities. Stroll along the historic downtown area, shop for unique gifts, tour historic homes, enjoy a holiday concert or get in the spirit of the season while viewing Christmas decorations. Frederick has dozens of special events in December. Here is a guide to the top things to do this holiday season. November 16–18 and November 23–25, 2018. Frederick Fairgrounds, 797 E Patrick St., Frederick, Maryland (301) 898-5466. Hours are Friday/Saturday 10 a.m.–6 p.m., Sunday 10 a.m.–4 p.m. Enjoy the works of 500 artists and craftsmen offering fine art, pottery, furniture, quilts, jewelry, clothing, wreaths and garlands, toys and Christmas ornaments. November 24 and 25, December 15, 16, 22, and 23, 2018, 11 a.m., 1 & 3 p.m. Take a scenic train ride with Santa. Reservations are required. Adults $16, seniors $15, children under 12 $13. Beware this event is extremely popular and usually sells out far in advance. December 1-2, 2018. Downtown Frederick. The self-guided walking tour takes visitors inside private homes elaborately decorated for the holidays. This year’s tour will feature eight homes with distinct architectural style, built between the 1750’s and 1950’s. Admission: $25 in advance, $30 on the day of the event. In 2018, a portion of the tour proceeds will benefit the Color on the Creek Project, Green-walled Garden Club and the Men’s Garden Club of Frederick. December 7, 2018, 6:30 p.m. Baker Park, South Carroll and West Patrick Streets, Frederick, MD. The town lights up with the holiday spirit as local groups march alongside German/English characters of yesteryear and modern favorites like Frosty the Snowman, Rudolph the Red Nosed Reindeer and Jack Frost. The parade ends with the lighting of the Town Christmas Tree. December 7, 2018. The self-guided event features free holiday-themed programs at over 20 museums and historic sites in Frederick County, Maryland. Enjoy period demonstrations, living history vignettes, hands-on crafts, refreshments, tours, music, holiday decorations and more. December 14, 2018, 7 p.m. All Saints’ Episcopal Church, 106 W. Church Street, Frederick, MD. Holiday greetings, carols and an inspirational message are all part of this event which highlights the true meaning of the holiday season. Attendees join in the program with a moving candle lighting ceremony, filling the Courtyard with magnificent light. December 14-16, 2017. Weinberg Center for the Arts, 20 West Patrick Street, Frederick, MD. The cast of over two dozen actors, the two-story set, the ghosts of Christmas Past, Present, Future and Tiny Tim will transport audiences to Victorian England as the penny-pinching Ebenezer Scrooge learns the error of his miserly ways and embraces the true spirit of Christmas. Tickets: $12-24. December 18, 2018, 8 p.m. Weinberg Center for the Arts, 20 W Patrick Street, Frederick, MD. The Frederick Chamber Singers, orchestra, and soloists lead an annual sing along to G.F. Handel's Christmas masterpiece. Tickets: $10-20. ﻿December 26, 2018, 4-9 p.m. Downtown Frederick. More than a dozen churches offer special programs, angelic choirs, and nativity scenes celebrating Frederick’s tradition of religious diversity, and local history.